Not to be confused with his son, Tim Raines, Jr..
Timothy Raines (born September 16, 1959), nicknamed "Rock", is an American professional baseball coach and former player. He played as a left fielder in Major League Baseball for six teams from 1979 to 2002 and was best known for his 13 seasons with the Montreal Expos. He is regarded as one of the best leadoff hitters and baserunners in baseball history. In 2013, Raines began working in the Toronto Blue Jays organization as a roving outfield and baserunning instructor. Raines is the 1986 NL batting champion, a seven-time All-Star, and four-time stolen base champion. He has the most stolen bases of any player not inducted into the Hall of Fame. Raines was born in Sanford, Florida, to Ned and Florence Raines. He attended Seminole High School in Sanford. As a baseball player at Seminole, Raines stole home plate ten times. He also rushed for 1,000 yards in eight football games and set two school track and field records that lasted for several years. The Montreal Expos selected Raines in the fifth round of the 1977 Major League Baseball draft. After debuting with six games as a pinch runner in 1979, he played briefly as a second baseman for the Expos in 1980 but soon switched to playing the outfield, and rapidly became a fan favorite due to his aggressiveness on the basepaths. In his strike-interrupted 1981 rookie season, he batted .304 and set a then Major League Baseball rookie record with 71 stolen bases,[note 1] breaking the previous mark of 56 steals set by Gene Richards in 1977. Raines was caught stealing for the first time in 1981, after having begun his career with a major league record 27 consecutive successful stolen bases. Raines was the runner-up for the National League's Rookie of the Year Award in 1981, which was won by Los Angeles Dodgers pitcher Fernando Valenzuela. Raines's performance dipped in 1982, as he hit .277 with a .353 on-base percentage. At the end of the season, Raines entered treatment for substance abuse, having spent an estimated $40,000 that year on cocaine. To avoid leaving the drug in his locker, Raines carried it in his hip pocket, and slid headfirst when running the bases. He used cocaine before games, in his car, after games, and on some occasions, between innings in the clubhouse. Raines would later testify at the infamous Pittsburgh drug trials, in September 1985. In 1983, Raines resumed his exciting play, stealing a career high of 90 bases, the second-best total in franchise history, and scoring 133 runs, a franchise record. He was named Expos Player of the Year in 1983, 1985, and 1986. In each season from 1981 to 1986, Raines stole at least 70 bases. He had a career-high .334 batting average in 1986, winning the National League Batting Championship. Raines maintained a consistently high on-base percentage during this period and a rising slugging percentage, reaching a career peak of .429 in 1987. Although he never won a Gold Glove Award, Raines was an excellent defensive player who led the National League with 21 assists in 1983 and, with 4 double plays, tied for the league lead in double plays by an outfielder in 1985. Raines became a free agent on November 12, 1986, but in spite of his league-leading play, no team made a serious attempt to sign him. (During this period, the Major League Baseball owners acted in collusion to keep salaries down.) On May 1, 1987, hours after being permitted to negotiate again with Montreal, Raines signed a new deal with the Expos for $5,000,000 over three years, and a $900,000 signing bonus. In his first game back on May 2, facing the Mets, although Raines had not participated in spring training or any other competitive preparation for the season, he hit the first pitch he saw off the right-field wall for a triple. Raines finished the game with four hits in five at-bats, three runs, one walk, a stolen base, and a game-winning grand slam in the 10th inning. Even without having played in April, Raines led the Expos in runs, walks, times on base, runs created, and stolen bases, in addition to batting average, on-base percentage, and slugging percentage. He also garnered MVP honors in the All-Star Game as he delivered a game-winning triple in the 13th inning. Raines would, in 1992, be one of dozens of players retroactively awarded collusion damages, receiving over $865,000. 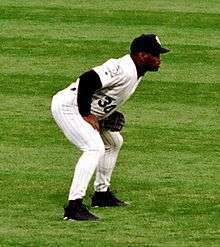 Raines was traded to the Chicago White Sox on December 20, 1990, along with Jeff Carter and a player to be named later (Mario Brito would eventually be agreed upon), in exchange for Iván Calderón and Barry Jones. In his first season in the American League, Raines hit for a .268 average but had a .359 on-base percentage; he was second on the team in runs scored as the White Sox finished the season in second place in the American League Western Division. His average improved in 1992 to .294 with a .380 on-base percentage. In 1993, despite missing nearly 6 weeks in April & May due to a torn ligament in his thumb he suffered while stealing a base, he managed to hit .306 with 16 home runs as the White Sox won the American League Western Division title. In the in 1993 American League Championship Series against the Toronto Blue Jays, Raines posted a .444 batting average and scored five runs in a losing cause. On December 28, 1995, he was traded to the New York Yankees. With the Yankees, Raines received two World Series rings in 1996 and 1998. While his playing time was curtailed due to injuries, he contributed to a loose clubhouse atmosphere, and was productive when he came up to the plate. In January 1999, Raines signed as a free agent with the Oakland Athletics. After a kidney biopsy on July 23, Raines was diagnosed with lupus and spent the rest of the year undergoing treatment and recovery. Raines was signed by the Yankees as a free agent on February 1, 2000, but was released on March 23. On December 21, Raines was signed by the Expos, returning to the team that drafted him. At the Expos home opener in 2001, Raines received what he described as the longest and loudest standing ovation in his entire career, resulting in the pitcher walking him on four pitches. With limited playing time, Raines batted .308, with a .433 on-base percentage and a .436 slugging percentage. Raines underwent surgery on May 31 due to a left shoulder strain, and spent time rehabilitating with the Expos Triple-A club, the Ottawa Lynx. On August 21, 2001, Raines and his son, Tim Raines, Jr., became the first father-son pair to play against each other in an official professional baseball game, when the Lynx played the Rochester Red Wings (the two had faced each other earlier in the year during spring training). Raines returned to the major league club on August 22. On October 3, the Expos traded Raines to the Baltimore Orioles, thereby permitting Raines to play a major league game with his son. On October 4, Raines, Jr. played center field and Raines, Sr. played left field for Baltimore, becoming the second father and son team to play for the same major league team (a feat previously accomplished by Ken Griffey, Sr. and Ken Griffey, Jr.). Raines played his last season in 2002 with the Florida Marlins. He is one of only 29 players in baseball history to date to have appeared in Major League baseball games in four decades, and was the last active player who was involved with the Pittsburgh drug trials. In a 23-year career, Raines played in 2,502 games accumulating 2,605 hits in 8,872 at bats for a .294 career batting average along with 170 home runs, 980 runs batted in, a .385 on-base percentage and a .425 slugging percentage. He ended his career with a .988 fielding percentage. Raines stole at least 70 bases in each of his first six full seasons (1981–1986), leading the National League in stolen bases each season from 1981 to 1984, with a career high of 90 steals in 1983. Raines also led the National League in runs scored twice (1983 and 1987). Raines batted over .300 in five full seasons and over .320 from 1985 to 1987, winning the 1986 National League batting title with a .334 average. He also had six full seasons with an on-base percentage above .390. With 808 steals in his career, Raines has the fourth-highest total in major league history, behind Rickey Henderson, Lou Brock and Ty Cobb. [note 2] Until 2008,[note 3] His career stolen base percentage (84.7%) was the highest in major league history for players with 300 or more attempts[note 4] and he was successful on 40 consecutive steal attempts between July 1993 and August 1995, setting an American League record at the time (the record was broken by Ichiro Suzuki in May 2007, when he completed 45 consecutive steals). Among switch hitters, Raines ranks sixth in career hits (2,605), fourth in runs (1,571), walks (1,330) and times on base (3,977), fifth in plate appearances (10,359), seventh in singles (1,892), doubles (430), total bases (3,771) and at bats (8,872), eighth in triples (113) and tenth in extra base hits (713). He holds Expos/Washington Nationals franchise records for career runs (947), steals (635), singles (1,163), triples (82) and walks (793), and was the seventh player whose career began after 1945 to retire with over 1,500 runs and 100 triples. [note 5] His 1,966 games in left field ranked seventh in major league history when he retired. From 1983 to 1987, Total Baseball rated him as one of the National League's five best players each season. He is also listed as the 40th greatest non-pitcher in major-league history according to Bill James's win shares formula, one place ahead of Mark McGwire. Raines was a National League All-Star in 7 consecutive seasons (1981–1987), and was named the Most Valuable Player of the 1987 All-Star Game. In 1981 the Sporting News named Raines the National League Rookie of the Year. Raines finished in the top 10 in voting for the NL Most Valuable Player Award three times (1983, 1986, 1987). He won a Silver Slugger Award as an outfielder in 1986 when he led the National League in both batting average and on-base percentage. In 2013, Raines was elected into the Canadian Baseball Hall of Fame. Raines was eligible for election to the Baseball Hall of Fame in January 2008, and various sabermetricians and commentators have supported his induction. Raines began his coaching career in 2003 as manager of the Class A-Advanced Brevard County Manatees affiliate of the Expos. He was promoted to the major league team in 2004 and was present for the Expos' final games as a Montreal franchise. He was a coach for the White Sox from November 2004 until October 2006. During the 2005 World Series Championship season, Raines served as first base coach. During the 2006 season, he served as bench coach. He was the hitting coach for the minor-league Harrisburg Senators in 2007, but was not retained by the team for 2008. Raines signed a two-year contract to manage the Newark Bears of the Atlantic League, starting in 2009. After the 2010 season, the Bears moved to the Canadian American Association of Professional Baseball, and the team announced Raines would return to manage in 2011. In 2012, he was an assistant coach and Director of Player Development for the Bears. The Toronto Blue Jays hired Raines as a minor league baserunning and outfield coach in 2013. In 1979, Raines married Virginia Hilton, a classmate at Seminole High School. The couple gave birth to two children: Tim, Jr. ("Little Rock"), and André ("Little Hawk"). In high school he was a running back and has said he enjoyed football more than baseball at the time. On the matter between the two he reflects, "...in football I was a running back, so in the NFL my career would have probably lasted six or seven years and in baseball I ended up playing 23 years. In baseball you can play a long time so I think it's better when you think of it in that way." In 1985, Raines became a resident of Heathrow, Florida. In 2007, he moved to Estrella Mountain Ranch, a suburb of Phoenix, Arizona, and married Shannon Watson from Arnprior, Ontario. Raines had twin babies in 2010. ↑ Some sources also place Raines behind Billy Hamilton, who recorded over 900 steals from 1888 to 1901; however, nearly 800 of these were achieved prior to 1898, when the definition of a steal was altered, and these early steals are not officially recognized. ↑ Carlos Beltrán passed 300 steal attempts in 2008 and as of September 20, 2008, has a higher stolen base percentage. ↑ Caught stealing data is incomplete prior to the 1951 season. ↑ The previous six were Willie Mays, Lou Brock, Pete Rose, George Brett, Robin Yount and Paul Molitor. ↑ Raines received this nickname at an Expo rookie camp when he was seventeen, based on his physique. Abel, Allen (May 28, 1981). "Raines defies Doubleday". The Globe and Mail. p. 55. ↑ In 2001, Bill James ranked Raines as the second greatest leadoff player in MLB history. James, Bill (2001). New Bill James Historical Baseball Abstract, The. New York: Simon & Schuster. pp. 684–685. ISBN 0-684-80697-5. ↑ McLaughlin, Dan (December 27, 2007). "The Path to Cooperstown: Tim Raines and the Tablesetters". HardballTimes.com. Retrieved April 30, 2008. ↑ Stark, Jayson; Peter Gammons (December 29, 2007). "Debate: Is Tim Raines a Hall of Famer?". ESPN.com. Retrieved April 30, 2008. ↑ "Toronto Blue Jays add Tim Raines to coaching staff: report". thestar.com. December 31, 2012. Retrieved March 29, 2014. ↑ Porter, David L. (2004). Latino and African American Athletes Today: A Biographical Dictionary. Greenwood Publishing Group. p. 311. ISBN 9780313320484. Retrieved January 24, 2016. ↑ Buchalter, Bill (September 25, 1994). "Seminole's top star still Raines at school". Orlando Sentinel. Retrieved January 24, 2016. ↑ "1977 Major League Baseball Draft". thebaseballcube.com. Retrieved October 8, 2010. ↑ Durso, Joseph (August 15, 1989). "Samuel Is Making an Impact". The New York Times. Archived from the original on September 3, 2015. ↑ "Expos' Raines makes off with SB record". The Sun. San Bernardino, California. Associated Press. August 30, 1981. p. D-6. Retrieved September 3, 2015 – via Newspapers.com. 1 2 Fimrite, Ron (June 25, 1984). "Don't Knock the Rock". Sports Illustrated. Retrieved May 4, 2008. 1 2 3 4 5 6 7 baseball-reference.com. "Tim Raines". Sports Reference. Retrieved July 4, 2011. ↑ Farber, Michael (2004). "Raines beats $1,000-a-week habit". In Brunt, Stephen. The Way it Looks From Here. Alfred A. Knopf. Originally published in The Gazette on 1982-12-11. 1 2 Anderson, Dave (May 5, 1987). "SPORTS OF THE TIMES; Nobody Wanted Raines". The New York Times. Retrieved January 19, 2008. 1 2 Keri, Jonah (December 29, 2007). "Raines: 'I played the game with excitement, focus'". ESPN.com. Retrieved January 19, 2008. ↑ "Retrosheet Boxscore: Montreal Expos 11, New York Mets 7". Retrosheet.org. Retrieved January 19, 2008. ↑ baseball-reference.com. "1987 Montreal Expos Statistics and Roster". Sports Reference. Retrieved January 19, 2008. ↑ Chass, Murray (December 15, 1992). "BASEBALL; Big Collusion Winners: Clark, Parrish, Dawson". The New York Times. ↑ Olney, Buster (October 16, 1998). "WORLD SERIES PREVIEW: YANKEES VS. PADRES – IN THE CLUBHOUSE; Before the Yankees Take the Field...". The New York Times. Retrieved January 19, 2008. 1 2 El-Bashir, Tarik (August 31, 1999). "Raines Returns, as Do the Laughs". The New York Times. Retrieved January 19, 2008. ↑ McKeon, Ross (August 7, 1999). "Raines diagnosis: Lupus". SFGate.com. Retrieved January 19, 2008. ↑ Olney, Buster (February 2, 2000). "Raines Gets a Shot At Resuming Career". The New York Times. Retrieved January 19, 2008. ↑ CBC Sports (August 22, 2001). "Father-son combos common in baseball". CBC.ca. Retrieved January 19, 2008. ↑ CBC Sports (October 3, 2001). "Orioles add elder Raines". CBC.ca. Retrieved January 19, 2008. ↑ "Tim Raines Sr. joins son on Orioles". ESPN.com. Associated Press. October 3, 2001. Retrieved March 6, 2009. ↑ "Charlton's Baseball Chronology – 2001". BaseballLibrary.com. Retrieved January 19, 2008. ↑ baseball-reference.com. "Baseball-Reference.com Leader and Record Board Index". Sports Reference. Retrieved January 19, 2008. ↑ baseball-reference.com. "Washington Nationals Batting Leaders". Sports Reference. Retrieved January 19, 2008. ↑ baseball-reference.com. "Baseball-Reference All-Star Game Index". Sports Reference. Retrieved January 19, 2008. ↑ The ESPN Baseball Encyclopedia. Sterling Publishing. 2007. p. 1768. ISBN 1-4027-4771-3. ↑ Stark, Jayson; Peter Gammons (December 29, 2007). "Debate: Is Tim Raines a Hall of Famer?". ESPN.com. Retrieved September 19, 2008. ↑ Pearlman (June 13, 2007). ""Rock" belongs in Cooperstown". ESPN.com. Retrieved September 19, 2008. ↑ Sheehan, Joe (March 24, 2000). "The Daily Prospectus: A Hall of Famer Retires". Baseball Prospectus. Retrieved September 19, 2008. ↑ Jazayerli, Rany (March 31, 2000). "The Case for Tim Raines: An In-Depth Look". Baseball Prospectus. Retrieved September 19, 2008. ↑ Darowski, Mike (February 17, 2006). "Hall of Fame Case: Tim Raines". The Rule V Baseball Blog. Retrieved September 19, 2008. Archived March 5, 2008, at the Wayback Machine. ↑ ESPN.com (October 14, 2006). "White Sox fire bench coach Raines". ESPN.com. Retrieved October 28, 2006. 1 2 3 Berry, Adam (January 2, 2013). "Raines to coach in Blue Jays' farm system". MLB Advanced Media. Retrieved January 3, 2013. ↑ "Rock Takes the Raines for 2011 Season" (Press release). Newark Bears. November 2010. Retrieved December 23, 2010. ↑ "Former Expos star Tim Raines joins Blue Jays staff for 2013". SportingNews.com. January 1, 2013. Retrieved January 3, 2013. ↑ Engel, Heather (March 29, 2014). "Raines thrilled with game's return to Montreal". MLB.com. Retrieved March 29, 2014. ↑ Fimrite, Ron (June 25, 1984). "Don't Knock the Rock". CNN/Sports Illustrated. Retrieved May 13, 2008. ↑ Benjamin, Samori (July 21, 2008). "Rock Solid". WBAI Sports. Retrieved October 1, 2008. As I got older I realized baseball could prolong your career, in football I was a running back, so in the NFL my career would have probably lasted 6 or 7 years and in baseball I ended up playing 23 years. In baseball you can play a long time so I think it's better when you think of it in that way. ↑ Elliott, Bob (August 11, 2007). "Elliott on Baseball". Canoe Inc. Retrieved May 13, 2008. ↑ "The Jonah Keri Podcast, Episode 11 (Part 1)". The Jonah Keri Podcast. 16:35 minutes in.